On occasion, users may come across this error message. Sometimes the error refers to a provisioning error as well. This may be caused by several reasons such as account being suspended due to low credit balance or other reasons. A user may also have added credits to the balance but still gets this message. It is an easy fix that the user can perform on their own. 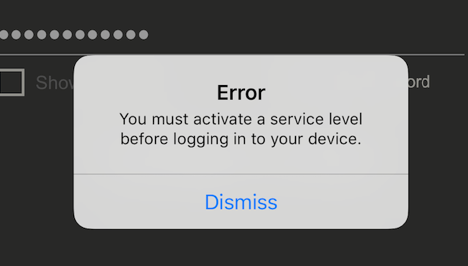 To resolve this error, first login to your Silent Circle account at https://www.silentcircle.com/ using your Silent Phone username and password. Once logged in, you should see your current account balance displayed. Be sure this balance is above the $9.95 monthly fee. If the balance is below the monthly fee, click on “manage balance” and add an appropriate amount to increase the credit balance. Now that the account has enough credit balance, the next step is to tell the system what to do with the balance. The user will now click on “enable silent phone”. The first click returns a warning that the credit balance will be deducted by the amount needed for the monthly subscription fee. The button now turns blue and the second click will apply the necessary funds and enable the services. This will resolve the error the user has been receiving.